To Miss Sophie-Alice! She is a long time doodley friend of The Fort. Sophie turns a tender six years old this coming Thursday. I wanted to mention this now, because I will have a few new pups to blog about over the next two days. So anywho, way to go girl! Here's to another six years, that I know, you most certainly have in you lol! 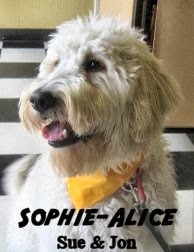 ;) Sophie Alice is one healthy and super-fit canine... Thanks to her mother's frequent and lengthy walks, weekly day trips to Fort Fido, and even Overnight stays. A special thank you goes out to Sophie's owners, Sue and John, for their continuous support over the last five+ years. We truly appreciate it. Thank you for your business.